Man do I love string cheese. I like the ones with jokes on them, but sometimes there’s trivia instead! Normally you can tell how delicious your string cheese will be based on how funny the joke on the package is. Trivia follows a completely different metric, however, and is much harder to measure accurately. 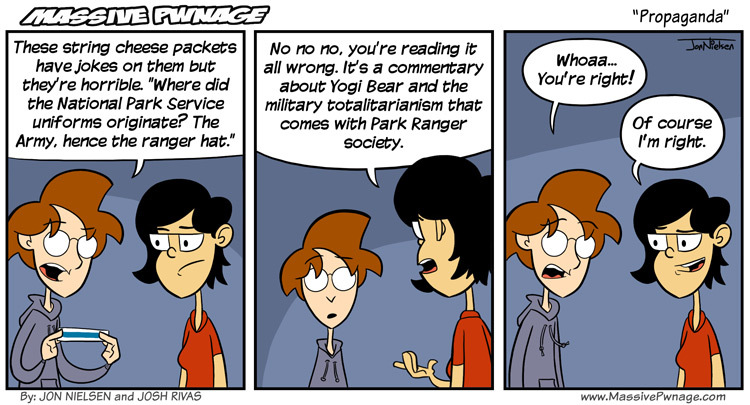 This entry was posted on Monday, March 7th, 2011 at 12:00 am and is filed under Comics. You can follow any responses to this entry through the RSS 2.0 feed. Both comments and pings are currently closed. Of course she’s right, when is she not right?